This is quite an old guide and apparently some of this destination may have changed due to storm erosion. 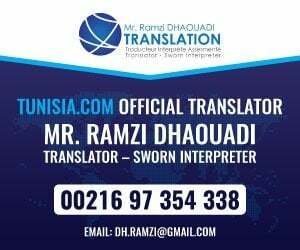 Tamerza is situated in the Djerid region of the south west of Tunisia, just a couple of miles from the border with Algeria. Generally travelling south in Tunisia means drier, dusty desert conditions increase. 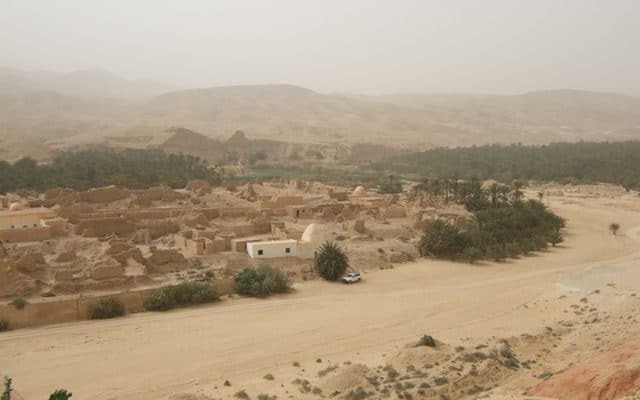 Tamerza is a sizeable mountain oasis amidst a dry and arid desert region. 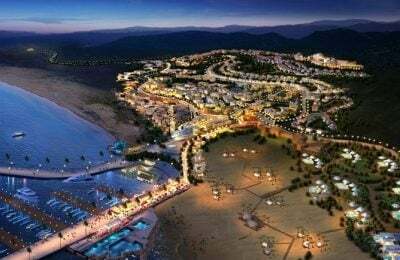 It can be reached by driving along route 3 from Kairouan to Metlaoui, then following minor roads from El Hamma du Jerid past the Chott El Gharsa salt lake for about 30km (20 miles). The train runs from Gabes to Tozeur during the summer months, stopping at the superb Gorges at Selja. Tamerza is 65km northwest of Tozeur and 95km west of Gafsa. However if you choose to travel, changes in the Tunisian landscape will gradually become apparent. Olive groves will be less in evidence; mountains become more jagged; rocks are now a soft, tawny color and the road becomes endlessly the same. Arriving in Tamerza is a very pleasant surprise. It is the largest mountain oasis in Tunisia and was known as ‘Ad Turres’ by the Romans. The town is based around a huge ravine, testament to the force of water which once gushed through the gorge. What remains is an impressive canyon with steep, curved rock faces with two attractive waterfalls. Their source is the springs in the mountainside and the waters cascade down the pink cliffs into the small stream in the gorge below. The main waterfall is about 5 metres high and runs all year round, although winter and spring are when it looks at its best. The walls of the gorge at Tamerza are quite impressive as they curve and wind around the stream’s course. The surrounding area has patches of green grass, low-growing plants and even some frogs and wildlife in the life-sustaining pools. Although Tamerza is remote, it gets a surprising number of visitors to its natural attractions, yet manages to remain largely unspoilt. The Tamerza Festival brings many visitors to the town and is usually held during April or May. As with many oasis towns, the festival is an opportunity to see the many local customs and skills of the Berbers. Turbaned performers will demonstrate their daring balancing acts on horseback; belly dancers will dance; young girls will perform ‘hair dances’; local musicians will play their strange local instruments and there may be camel fights and rabbit chases. These will all be accompanied by many roadside stalls selling pottery, glazed tiles, carpets, minerals, drinks and food. Within the town there is the luxury Tamerza Palace Hotel which is one of the most tasteful and luxurious hotels in Tunisia. It is somewhat at odds with the old ruins and adobe huts of the town just across the wide, tree-lined street. The many ruins were left when the town was abandoned in 1969 after 22 days of rain. The river flooded disastrously, and the dry brick and mud built homes were unable to withstand the floods, although some homes and zawiyya mosques (shrines) have since been rebuilt. The ruins clearly show the typical architecture of this region of the Sahara. From the hotel restaurant terrace there are magnificent, far-reaching views of the ruined town and the sand-colored hills beyond, broken by small pockets of greenery and palm trees. The hotel is an excellent location to enjoy refreshments or for an overnight stay before exploring more of Tunisia’s desert and oasis towns.